The Construction Industry Federation (CIF) will hold its annual conference on Thursday the 1st of October at The Hogan Suite, Croke Park Conference Centre, Dublin. This year’s conference is in association with Maples and Calder. The theme of the CIF annual conference for 2015 is ‘Activity, Jobs and Solutions’. 2014 saw 13,100 new jobs created in the sector. This was 45% of all new jobs created in Ireland overall in 2014. In the first quarter of this year a further 6,300 jobs have been created and this momentum is continuing. This is a clear sign of a sector in recovery. This year’s CIF conference will focus on two of the key drivers of the construction industry; the value of foreign direct investment projects to the industry and housing. FDI is key to the recovery in the construction sector. Each new FDI job announcement is very welcome, however these jobs are not the whole story. With each announcement comes activity for our industry. New offices and commercial buildings, plants, factories, warehousing along with upgraded roads and general transport infrastructure follow each announcement. This means jobs for construction workers, allied industries and professions. 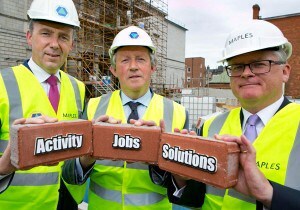 Pictured at the John Paul Construction site of The National Gallery are Michael Stone, President, CIF, Tom Parlon, CIF Director General, Dudley Solan, Partner and Head of Commercial Litigation and Dispute Resolution Group, Maples and Calder. On the 1st of October the CIF will be concentrating on the value of FDI to the construction industry and how the construction sector can help to facilitate future investment throughout the country. High level speakers from the IDA and key players from within the FDI sphere will give voice to how the industry can play a key role in attracting FDI to Ireland. Construction is a fundamental driver of the economy. Each new construction job created drives activity throughout the economy. In order to have a fully functioning economy construction should make up between 10 to 12% of GDP. In 2014 the construction sector was worth 6.9% of GNP, it is expected that this will grow to 7.5% in 2015, while this represents excellent growth, there is still some way to go to reach the optimum level of activity. Earlier this year the CIF published 12 steps for 20,000 construction jobs. If the Government were to take these measures 20,000 more jobs could be created in the industry over the next three years. The CIF has an excellent line-up of top level speakers from the IDA, key FDI industries and housing experts who will provide attendees with up to the minute insight and expertise on the construction sector. ← The 2015 Intel Women in Technology Scholarship Program is now open!